Whether a parent or pastor, child advocate or Christian educator, professional or volunteer working with children, we yearn for both comfort and challenge, vision and validation, hope and help as we seek to make a difference in the lives of children. In Hope for the Future, Shannon Daley-Harris draws from over twenty-five years of work with the Children's Defense Fund to offer twelve meditations for those working to create a better world for our children. Each meditation focuses on passages of Scripture and weaves together moving stories of children, startling statistics about the challenges facing children, and inspiring examples from other movements and faithful leaders that came before us. Questions for faithful response after each meditation will prompt further reflection and action. This inspirational book can be used as a devotional, in Bible study discussion, or during a social action committee's discernment. 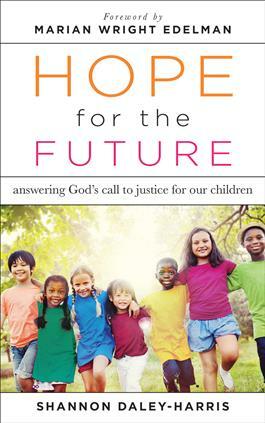 "In these twelve compelling meditations, Daley-Harris gives us a glimpse of the faith and conscience that animates the tireless and strategic work of the Children's Defense Fund. She has deftly woven together poignant scriptural texts, inspirational stories from Movement history, and reality-checking reports about the current health and welfare of the `least' among us. May these elegant reflections and focalizing discussion questions fire your imagination about how to become a better `torch bearer and torch sharer' with the Children's Defense Fund in the holy work of justice and compassion." "What does it mean to weep for our children? What does it mean to hope for our children? What does it mean to listen to the deep needs of our children? Daley-Harris brings us reflections that move us beyond what we know to be true about the state of children in our communities to a place that challenges how we live into our responsibilities as children of God. Through current stories that echo Scripture, these meditations inspire teachers, pastors, caregivers, and parents to look, listen, and `move our feet' in order to care for all of God's `little ones.' I encourage congregations to use these meditations and questions as they advocate for compassion and justice for all children." "Through fascinating stories, imaginative exegeses and gems of wisdom from our little ones, Daley-Harris makes a convincing case that the future will be brighter for us all if we set our children free to be effervescent channels of divine light and love." "Activist, preacher, thought leader, and compassionate human being, Daley-Harris has crafted a book our evolving democracy desperately needs to embrace. Read and be enlightened by this powerful voice of justice." "If your work is related to children in any shape, form or fashion, I urge you take a look at Daley-Harris' book, Hope for the Future. I think you'll find it an important contribution to a topic all of us should care deeply about." —Parker J. Palmer, author of The Courage to Teach, Let Your Life Speak, and Healing the Heart of Democracy.